Google CEO Sundar Pichai says Google’s search algorithms are unbiased. 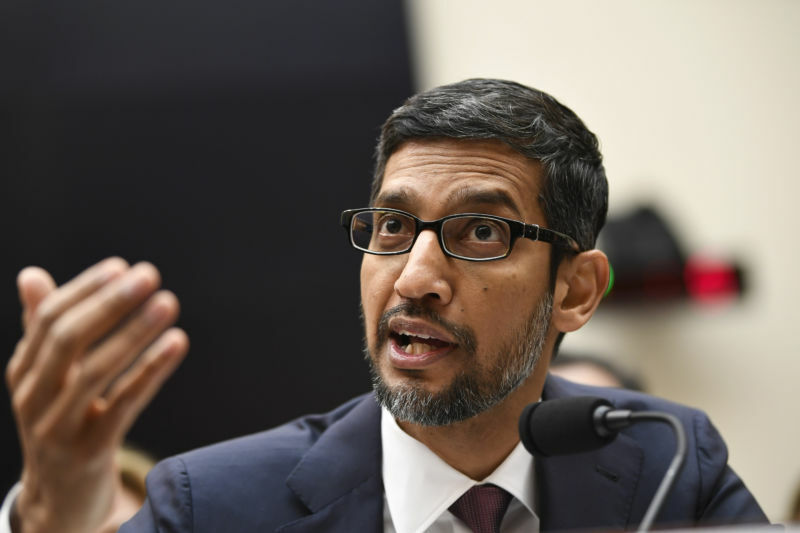 At a House Judiciary Committee hearing Tuesday, members of Congress grilled Google CEO Sundar Pichai about a variety of topics, from user privacy to the possibility of a censored Chinese search engine. But the focus of the hearing was political bias. Chabot was just one of several Republican committee members who charged that Google’s search algorithms—and its employees—were biased against conservatives. But Pichai stood firm, insisting that Google has rigorous procedures in place to ensure that the personal political views of Google employees don’t undermine the objectivity of search results. Republican members of Congress weren’t really buying Pichai’s responses. But the question is whether they’ll try to do anything about it. The Republican party has traditionally favored less, not more, regulation of business. Some Republican lawmakers and conservative commentators have started suggesting that there should be an exception made for Google given its vast online footprint and its perceived liberal bias. But Republican policymakers still seem quite far from taking decisive action on this front. Republicans spent a fair amount of time at Tuesday’s hearings establishing that a lot of liberals work at Google. Rep. Louie Gohmert (R-Texas) pointed to a leaked video from one of Google’s weekly all-hands meetings shortly after the 2016 election. Rep. Jim Jordan (R-Ohio) grilled Pichai about a recently leaked email sent out shortly after the 2016 election by Eliana Murillo, a director of multicultural marketing efforts at Google. In the email, Murillo described Google’s efforts to increase turnout among Hispanic voters—an effort she initially characterized as nonpartisan. But in the same email she goes on to describe Trump’s election as “devastating for our Democratic Latino community. After all these efforts and what we thought was positive momentum toward change, the results are not what we expected at all.” In short, the email made it clear that Murillo, at least, had a partisan agenda. Pichai told Jordan that an internal investigation had not turned up evidence that Google was engaged in partisan political activities. Meanwhile, some Democrats came to Google’s defense. Rep. Ted Lieu (D-Calif.) sarcastically reminded his Republican colleagues that Google’s search algorithms were protected by the First Amendment. It was a bit odd to see Democrats like Lieu defending the free speech rights of corporations while Republicans called for stricter regulation of a private company. Ordinarily, of course, the shoes tend to be on the opposite feet, with Democrats advocating stricter regulation and Republicans defending free-market policies. Some Republican committee members acknowledged this tension during Tuesday’s hearing. “I don’t want to regulate anything,” said Rep. Steve King (R-Iowa). But he signaled that regulation could be on the table if Google doesn’t change its policies. King demanded that Google publish full details about its search algorithms. If those details aren’t forthcoming, King said he would consider revising Section 230 of the Communications Decency Act—legislation that currently shields online providers like Google from lawsuits over user-generated content. “After that is the Teddy Roosevelt step,” he said, an apparent reference to stricter antitrust enforcement. This has been an increasingly common refrain on the political right. Fox News host Tucker Carlson regularly criticizes Google for monopolistic practices. “Since it has the power to censor the Internet, Google should be regulated like the public utility it is, to make sure it doesn’t further distort the free flow of information to the rest of us,” Carlson said last year. In November, Missouri elected a new Republican senator who campaigned on an anti-Google platform and has suggested that stricter antitrust scrutiny is needed. Theoretically, President Trump also favors stricter antitrust enforcement against technology giants. In a November interview with Axios on HBO, Trump said he was “looking at” stronger antitrust enforcement against Google, Amazon, and Facebook. Trump’s problem is that most Republican-leaning antitrust experts don’t agree with this viewpoint. Since the Reagan years, most conservative intellectuals have favored looser antitrust enforcement—a position that’s popular among the GOP’s allies in the business world. And antitrust decisions are supposed to be made independent of interference from the White House. As a result, the Trump administration’s antitrust agenda has not been dramatically different from that of previous Republican presidents. In September, Trump’s choice to lead antitrust enforcement at the Justice Department, Makan Delrahim, questioned whether there was “credible evidence” of antitrust violations by large technology companies. If Republicans were serious about curtailing the power of Google and other technology giants, they would need to do more than hold a few hearings on the subject. They would need to develop a roster of conservative antitrust practitioners who favor stricter enforcement—at least with respect to technology giants. Or else they’d need to pass new legislation specifically regulating the companies. Republicans are pretty far from doing any of that. And if they did, Google would have strong defenses available. If a future Republican administration brought an antitrust case against Google, it would have to convince the courts that Google was engaged in anticompetitive conduct—an argument that the courts might view with skepticism. Directly regulating Google’s search algorithms could be even dicier, since Google would be able to invoke the First Amendment.